Blumsom Timber Centre stock a large variety of MDF including Melamine faced, Medite, Flexible, V-Grooved & Beaded MR and Fire Rated (Euro Class B). Medium Density Fibre is an engineered wood product made by breaking down hardwood or softwood residuals into wood fibres. Often in a defibrator combining it with wax and a resin binder forming panels by applying high temperature and pressure. 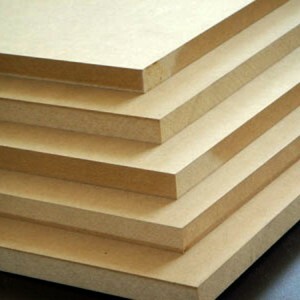 It is generally denser than plywood with a clean finish, grain or knot free. Ideal for any building project taking well to most adhesives, paints and veneers, and easy to sand. For areas of high humidity such as kitchen and bathrooms we stock moisture resistant, if you are unsure of which is best suited please contact our team for advice. Available in a variety of sizes and 3mm, 6mm, 9mm, 12mm, 18mm , 25mm and 30mm thicknesses.